The 2012 NHL Awards were a collection of bad jokes, funny sketches, Erin Andrews, Patrice Bergeron's girlfriend and what used to be Matthew Perry, wrapped around some genuinely intriguing vote totals. Like, for example, Erik Karlsson of the Ottawa Senators winning the Norris Trophy for best defenseman despite widespread criticism of his defense. Coming up, how Karlsson won the Norris, how Gabriel Landeskog won the Calder and how Evgeni Malkin won the Hart in an absolute landslide. 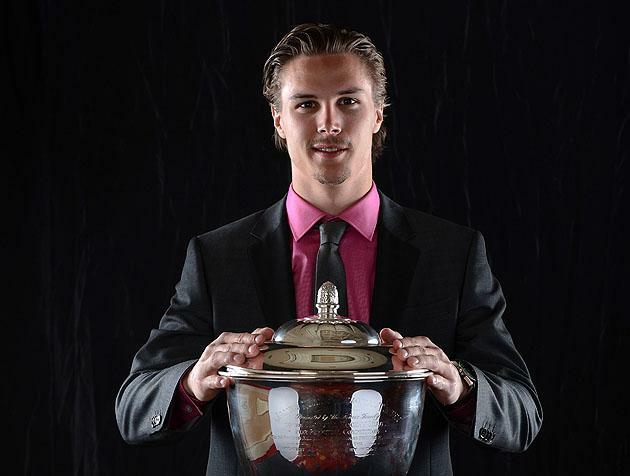 Erik Karlsson of the Ottawa Senators won the Norris by a 12-point margin over Shea Weber of the Nashville Predators, with Zdeno Chara of the Boston Bruins close behind. Thing is, Weber lost by an even thinner margin last year: Nine points behind Nicklas Lidstrom. Geez, what other indignities can this guy suffer? Oh, right: Wait until he loses to Ryan Suter next year! 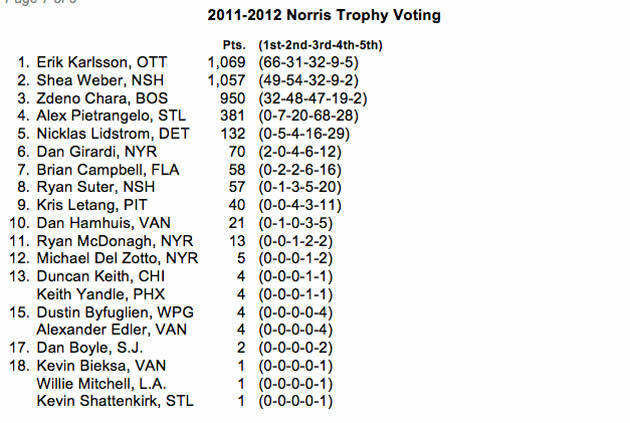 Does Lidstrom get more votes if the writers knew it was his final season? Of course. Should Dan Girardi have gotten more than two first-place votes? Probably. Is the presence of Dustin Byfuglien on this list completely inexplicable? Totally. The NHL's broadcasters vote on this one, and it's easy to understand the support for Hitch. The guy made an obvious difference on special teams and with individual players on the team. The Blues went from average to one of the best teams in the League, and that's on Hitch. Quite a race between the NHL's two most surprising teams for third place: The Ottawa Senators and the Florida Panthers. Paul MacLean had the edge. Sometimes we think about how we live in a world where Mike Babcock gets one third-place vote for coach of the year, and it makes us sad. Doug Armstrong received the most support for GM of the Year, but give it up to Dale Tallon for eclipsing David Poile in the rankings. 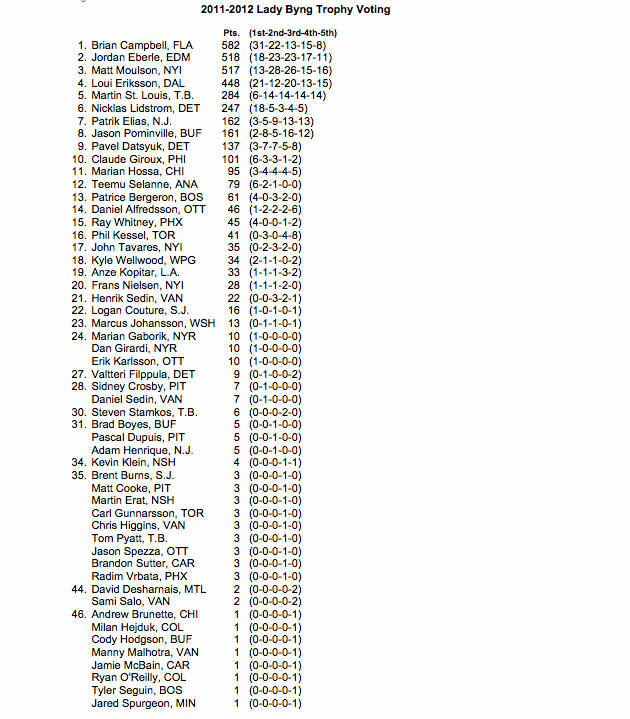 Greg Sherman received a second-place vote from someone that must hate the Capitals. Brian Campbell bested Jordan Eberle to make a little history. But the reason you read this list is for the absolutely absurd players that make the cut for "gentlemanly," such as Sidney Crosby and ... Sidney Crosby. 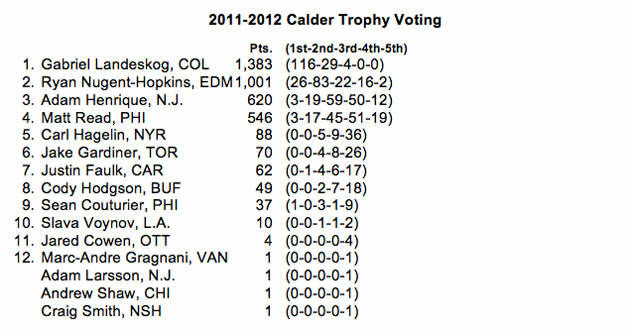 Finally: That fourth-place vote for Matt Cooke? It wasn't us. Gabriel Landeskog of the Colorado Avalanche won this thing comfortably, which is surprising given Ryan Nugent-Hopkins' stellar body of work in a truncated 62 games. The margin between Adam Henrique and Matt Read for the final spot was tight but not razor thin; again, a surprise given Read led all rookies in goals. Interesting to see Sean Couturier of the Philadelphia Flyers receive a first-place vote while a player like Justin Faulk of the Carolina Hurricanes didn't. As expected, Jonathan Quick and Pekka Rinne shared support from the Western Conference while Henrik Lundqvist smoked every other Eastern Conference goalie. The GMs vote for this award. So did the Brian Elliott first-place vote come from Bryan Murray? That's a pretty wide margin for Patrice Bergeron, reinforcing that this was a reputation-based win for the Boston Bruins center. David Backes edged Pavel Datsyuk for second, which is an achievement in itself. Great support for Ryan Callahan of the New York Rangers; inexplicably soft support for Jonathan Toews of the Chicago Blackhawks. So Evgeni Malkin has some subtle support for MVP. Miniscule at best. Last season, Corey Perry had 67 first place votes and 1,043 points; Daniel Sedin was second with 51 first-place votes. 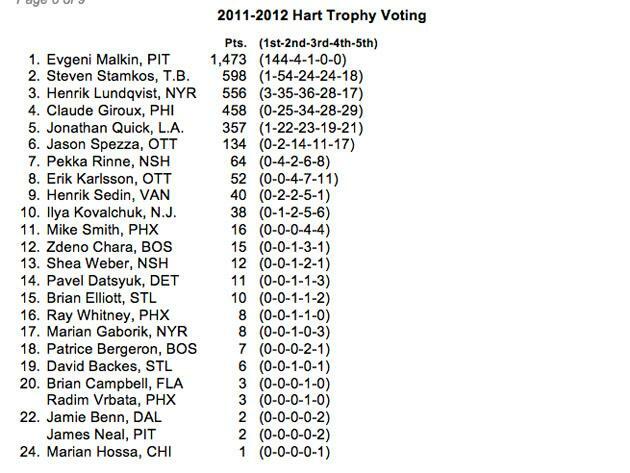 So Malkin's support here is an absolute landslide. 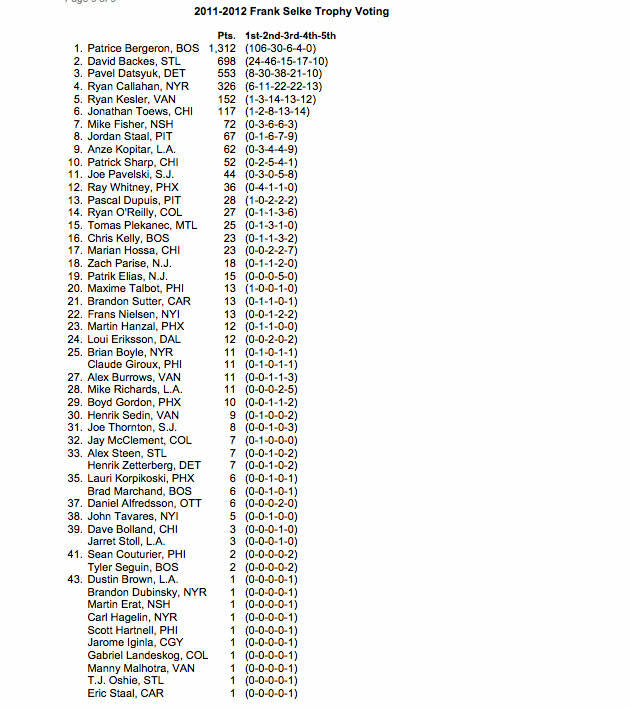 The real story is Steven Stamkos getting 54 second-place votes. Wonder how many legitimately placed him behind Malkin and how many couldn't give the Hart to a player from a non-playoff team?